Add seafood to your lineup of Sunday dinner dishes. This creamy pasta recipe is easy to make and makes a big impression on diners. Aside from the fab flavor, the thing you'll appreciate most about the creamy sauce is that it only takes about five minutes to make. That means very little effort is involved, and the payoff is big. Salmon brings added heartiness and color to this rich dish. Although it's a lovely meal to serve for a special occasion, I suggest you consider it for any Sunday dinner. Cook the pasta according to the package directions. When finished, drain it and return it to the pot. About 5 minutes before the fettuccine has finished cooking, add the butter to a saucepan over medium heat. Add the cream and cook it until it bubbles just slightly, for 3-4 minutes. Add the Parmesan cheese and stir. Remove it from the heat. Add the fettuccine to a large bowl along with the green onions, parsley and salmon pieces. Pour the cream over the fettuccine and toss to coat all the ingredients. Season with a bit of ground black pepper and extra Parmesan cheese as garnish. 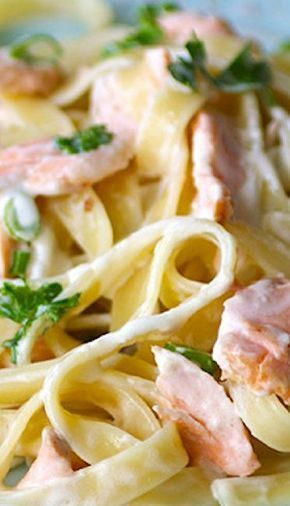 0 Response to "Creamy salmon fettuccine recipe "